I received complimentary products to provide this giveaway. All opinions are my own. It is getting HOT out there. Of course it has been raining the past few days here in Georgia. On those days we like to do arts and crafts and watch some movies. My daughter is four and she still loves Curious George. She also loved the Maya the Bee Movie. So here's your chance to win both for your little one/s! Grab some free coloring and activity sheets, then enter to WIN the DVDs below! Miriam Margolyes, Richard Roxburgh, Noah Taylor, Kodi Smit-McPhee and Justine Clarke. View the trailer HERE. Buy Now on Amazon. Check it out on Netflix! In honor of Curious George 3: Back to the Jungle now available on DVD and Digital HD from Universal 1440 Entertainment, here are some awesome coloring sheets! View the trailer HERE. Buy Now on Amazon. Check it out on Netflix! Enter to WIN! Enter to WIN a copy of Curious Georgia 3: Back to the Jungle and Maya the Bee Movie. This giveaway is open to US only, must be 18+ to enter. One entrant per IP address. Nanny to Mommy is not responsible for prize fulfillment. Good luck! 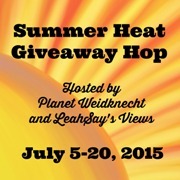 Welcome to the Summer Heat Giveaway Hop! I received complimentary products to provide this review and giveaway. 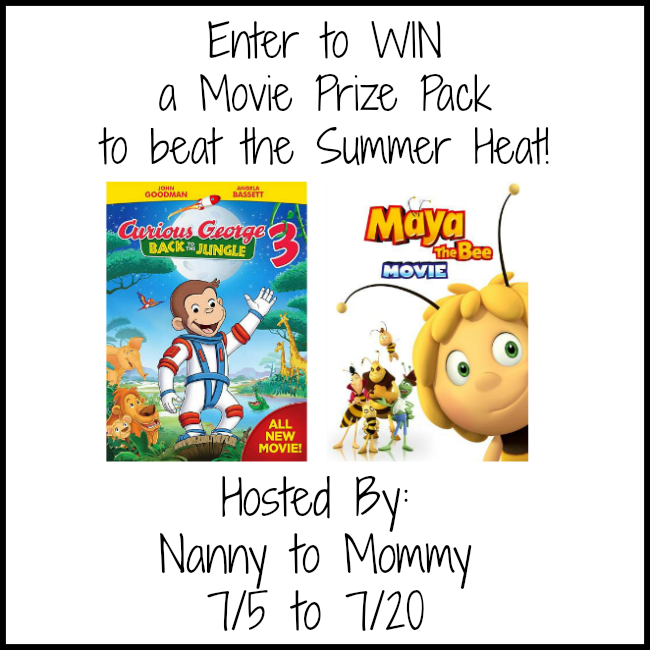 Nanny to Mommy is not responsible for sponsors who do not fulfill prize obligations. To beat the summer heat, I use an ice pack on the back of my neck and drink lots of water when I'm outdoors. We go to the neighborhood pool. We drink lots of water. Refillable bottles go along with us every time we get in the car, and we sip on them all day long at home too. I drink plenty of water and mainly sit out on my back patio and read. I can't hardly handle the heat anymore. We spend a lot of time in the pool when it's really hot, or really any day that it's nice out. We beat the heat by playing at the pool and splash pad! We also stay indoors in the hottest part of the day most days. To beat the summer heat we either hang out in the pool or play with water balloons and the sprinkler! I head to the beach or a pool to beat the heat. to beat the heat, I get out the kiddie pool or the water table. We have movie days/nights, lots of water play & crafts! We go to the beach! We usually hang out in the pool or go to the lake. When it gets hot I get out the water table and the kiddie pool. I also try to stay in the shade and drink plenty of water. Hydrate with water, gatorade/powerade or coconut water. And I try to do errands earlier in the morning (before 10a) or anytime after 3p or 4p. The humid gets to me and my son, so we stay inside until it gets cooler. Spend our time reading books, watching movies or tv shows. We schedule things for outdoors in the early morning or late evening.We love going swimming too. To beat the Summer heat I spend time at the pool in my apartment complex or at the beach. So fun & refreshing! Go to the beach or cool off with an iced tea inside with the AC! Take a shower, use cooling pads, lots of water, and go out after dark. I stay in door's and read a good book! to hot out side. We stay inside around the A/C! It's been so hot out lately that even it is having problems staying ahead of the heat! i beat the heat by staying hydrated and dressing accordingly, as well as wearing sunscreen. We beat the summer heat by having ice cold water balloon fights at night with glow sticks! its so fun, my boyfriend even joins in on it!